Alvey pledges to address community problems – Welcome to Wyandotte Daily! The new mayor and chief executive officer of Kansas City, Kansas, David Alvey, said on Tuesday night that he will address community problems. 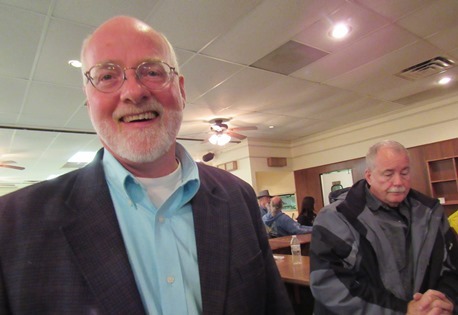 Alvey was elected Tuesday with 51.8 percent of the vote to incumbent Mayor Mark Holland’s 47.4 percent. Alvey, who had a lot of support from public safety workers here, including firefighters, said the first thing he will do is get a much closer read on the problems facing Kansas City, Kansas, and Wyandotte County. “I will take an honest look at the problems, and I will not try to sugar-coat anything,” Alvey said. “For instance, I want to dig more deeply into the $500 million in deferred maintenance and just see what that means for us financially, and how do we tackle that problem,” Alvey said. “That just seems to me to be an outstanding issue. “I also want to take a deeper look into the kinds of development deals we do as a city,” Alvey said. He said he is holding out hope that as new developments come into play, the Unified Government could generate more revenues from them sooner. “We need to broaden the tax base,” he said. While development is great, if the UG is deferring revenues for too long a period of time, the UG won’t be able to address the real needs of the city, which are infrastructure and taxes, he said. Themes that Alvey talked about during the campaign included lower property taxes, no bailouts for the T-Bones baseball club, UG spending for the mayor’s bodyguard, and development in other areas of the community, not just the west side (see http://wyandottedaily.com/holland-alvey-spar-about-utility-rates-taxes-and-spending/). During the past election campaign, there may have been a disconnect between what local leaders were saying and what people in the community were feeling. Juliana Alvey, who worked on the campaign, said the win came about because of hard work, going door-to-door in the community and talking to people. Firefighters took an active role in the campaign, carrying signs in support of Alvey. There was a 23.7 percent turnout in the election, which is slightly higher than what was expected. David Alvey is a Turner area resident who has served several years on the Board of Public Utilities. He also served on the Planning and Zoning Commission in the past. He has a degree from St. Louis University and has done graduate-level work. He and his wife have five children. His family includes a grandfather who served in local public office. Alvey said he plans to be a full-time mayor, and will resign from his job as assistant principal for faculty formation at Rockhurst High School in January, effective on the day he will start his term as mayor. While there may not be immediate changes planned for the Fire Department, Alvey said based on the fire services organization study, Kansas City, Kansas, needs to expand its fire protection. Kansas City, Kansas, also should provide more police protection for safer neighborhoods, he said. The hard part, he added, is how you do that — at the same time meeting the needs of the community and reducing the tax burden. “It comes down to expanding the tax base,” he said. See a related story, http://wyandottedaily.com/alvey-wins-kck-mayors-race/.